Does the very word "Computer" send a shiver down your spine? 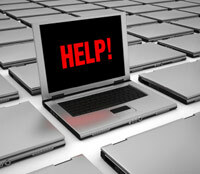 Horizon IT specialise in help and assistance to the home user market. We understand that not everyone is at ease with new technology, and when the need arises, simply for advice and help, we can provide a friendly engineer who will explain the basics, step by step, not only to resolve your issues but also to demonstrate the basics whilst we work with you. We are a services company, and that means services not only to businesses, education and corporate companies, we also include individuals within our scope. You purchase the hardware and software (or we can supply), and we will make it work! We understand that setting up a PC is a simple process, but times are changing. Users now want to integrate digital camera and photographs with their PC, to have the facility to print and scan photo quality pictures. You need broadband to access and utilise internet and email, but are unsure of which provider to use. You may require wireless broadband or wireless networking in your house, but are unsure of both concepts, safety, and how to get it working!! Remote working from home will be a big part of the future. Horizon IT can assist with the setup of your home/office, and help in the setup of access to your office. From single PC Installations with printers and scanners, to wireless networked systems with email and internet, our principles remain the same. Listen, assess, recommend and implement to the highest quality… at an excellent cost. We make things simple, and make technology work! Please email info@horizon-it-systems.co.uk for hourly prices and technical information or call 07703 838591 / 08452990884 for more help.